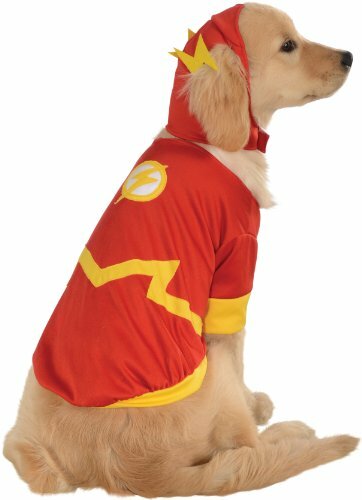 Officially licensed DC Comics The Flash pet costume features red and gold shirt with Flash symbol and matching headpiece. IMPORTANT! NOT ALL COSTUMES WILL FIT ALL PETS, consider costume style and animal size; READ THE RUBIE’S PET SIZE CHART and WATCH THE SIZING INSTRUCTION VIDEO, do not select size based on breed. Family-owned, family-focused, and based in the U.S.A. since 1950, Rubie’s is the world’s largest designer and manufacturer of costumes – of course they’d remember your four-legged best friend!